Horses allow us to strap leather to them, put metal in their mouths and carry our weight on their backs – generally without complaining too strenuously about what we ask them to do. In return, they ask that we feed, water and care for them. They do not lay guilt trips on us when we are too busy to spend time with them. They are willing to work for us in the round pen at liberty if we have given them a reason to accept our requests. They are willing to follow us if we have earned their trust in us to lead them by keeping them safe. My goal is to earn that trust every time I interact with them. And this has spilled over into my relationships with people. Others may not share my opinions, but that does not make their opinions and perceptions less valid than mine. I strive every day to remember these things. And that is just part of the gift I’ve been given and want to share. Jocelyn is a Certified Practitioner of the Equine Gestalt Coaching Method® (EGCMethod®). In the EGCMethod®, the horse is an active partner with the coach in the client’s exploratory process. Our philosophy is that all of us carry the answers to our problems within us — the coaches and horses are there to guide and facilitate the process of discovery with the students. Our programs are not riding lessons. What we can learn from the horses is to stand in our own power and live authentically in the moment. To show up as who we truly are, rather than what we think others expect us to be. To do this, riding is seldom required. The best partnerships are forged on the ground, not in the saddle. Interacting with horses gives us the opportunity to look at the world from someone else’s perspective – and that is a skill that is transferable to our lives away from the sanctuary of the ranch. Afraid of horses? Lucky you! If you are afraid of horses, this is an ideal place to face your fears safely. Facing our fears in a safe and supportive environment gives us practice in stepping through fear into courage. The more comfortable we can become with discomfort, the more of life we will be able to experience. If you are a “horse crazy teenager” at heart, you’ll fit right in. Our horses are happy to spend time with people that appreciate how majestic and wise they are. Jocelyn provides coaching services with the horses as co-facilitators at the farm, or via Skype or telephone (no equine assistants). Jocelyn’s firm, yet compassionate and encouraging manner and the beautiful space she held for the experience to unfold was perfect. 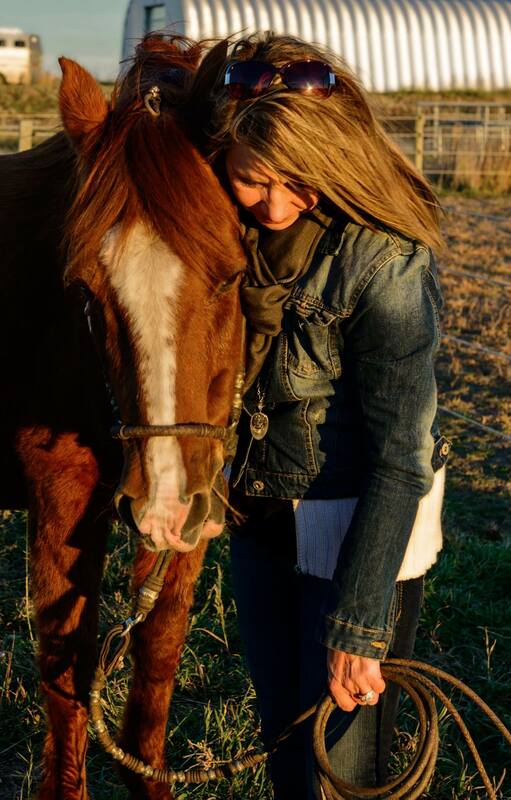 Her experience and the close relationship she has with her horses helped to create a safe and loving space. My session with Jocelyn was magical. I thought I was going to talk about something completely different when I sat down with her. Through her honest, insightful questions we were quickly on a topic much different and important that was hidden under my surface chatter. Her quiet strength made me trust her and the horse she partnered with making me feel safe and supported the whole time. It is hard to describe how you just know that no matter what you are not being judged and you will not be let down. That kind of support isn’t always so easily found in life. I can’t wait to be with her again. It won’t be soon enough! Thanks for everything! It has been a few weeks since our group joined you for a Saturday workshop. I just wanted to extend my thanks to you for sharing your home, wisdom and beautiful horses with us. It wasn’t until the next day that I realized what it was that I learned from the horses. Thanks very much!